Couldn't help myself from taking a crack at one more recipe from Bi-Rite Market's Eat Good Food before moving on. 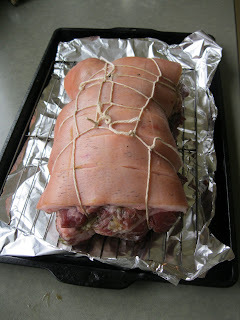 I've already blogged about a couple of porcetta dishes so this is one more. I modified a few steps on the Bi-Rite recipe so I'd recommend checking the one in the book as well. Hell I'd highly recommend buying the book anyway as it's a great resource for any home cook. A few discrepancies from the published recipe apply here. I used a pork shoulder I purchased from Marin Sun Farms in Oakland. I ordered the pork asking that it be from a heritage pig with the skin on but never did get a straight answer whether or not the pig was indeed heritage. Regardless, I've never had anything from them that was not very good and well worth the extra cost. However when I got it home and opened the wrapping, the skin was separate from the cut and twined together with the meat which I found a bit strange - the whole package turned out great anyway. I cut the twine in order to butterfly the cut in order to marinate it before tying it up again in my own clumsy manner. After leaving the pork in the frig overnight to marinate, I did the first 30 minutes of searing in the oven at the higher temperature before transferring it over to my Big Green Egg for the remaining 3 hours of cooking at the lower temperature using some hickory wood to get a nice smoky flavor to the meat. Make the marinade by adding the garlic to a mortar with the remaining ingredients and pound into a paste. On a cutting board sit the pork with the skin-side up and score the skin in a crosshatch pattern of 1 inch squares taking care not to cut all the way through to the meat. I found that besides tenderizing the skin a bit, this step also makes it much easier to cut it into crackling at serving time. Turn the pork skin-side down to cut in half horizontally so that it opens like a book, cutting along the natural seams as much as possible. Spread most of the marinade paste over the meat before closing it back up into the original shape. Spread the remainder of the paste over the closed meat then turn it back over to skin-side up in order to twine at 2-inch intervals. Put the roast onto a rack set over a baking sheet to sit in the frig overnight (or up to 72 hours). An hour prior to when you are ready to cook the roast, take it out of the frig and allow it to come to room temperature. Meanwhile preheat the oven to 425F. When the pork has warmed, put it directly into a roasting pan and then into the preheated oven to sear for 30 minutes. Turn the temperature down to 300F and allow to cook for about 3-4 hours or until the pork is done. The book suggests that the pork will be done when it is visibly wobbly and a fork can enter the meat with little resistance, but I cheated and used a thermometer to get a reading of at least 145F internal temperature to determine when it was done. I then removed the pork and moved it back into the oven to keep warm at 140F covered with foil while I cooked the rest of the meal. Let the roast rest on a cutting board for at least 15 minutes or longer, then slice the meat into 1/2-inch slabs and the skin into 1-inch squares for serving. Quarter the cabbage lengthwise and then crosswise into thin strips. Place in a large bowl along with the carrots. In a small bowl whisk together the oil, vinegar, mustard, honey, fennel seed, 1 teaspoon salt, and 1/2 teaspoon black pepper. (I add everything to a small jar with a cover then shake to emulsify and mix.) About 10 minutes prior to serving, drizzle the dressing over the cabbage and carrots and toss well. Let rest about 10 minutes then toss again, adding more vinegar and salt to taste.